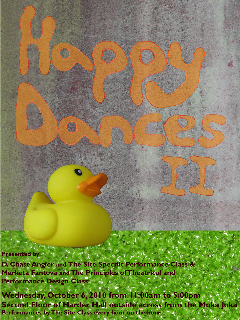 The second site specific dance in the Happy Dance Series, Wednesday, October 6 from 11:00am to 5:00pm second floor of Harder Hall (in the outside courtyard across from the Moka Joka). Bounce away the gloom of midterms and Get Happy! We can’t do it without YOU! When you sign the form, you are making a commitment to show up and participate! Participants do not need to be present for the entire duration of the performance, only their own 15-minute time slot, although we invite you to join us every hour on the hour for performance by the Site Specific Class and to stay as long as you like! This entry was posted in Fall 2010, Happenings on September 29, 2010 by ruralscape.